Who do I see standing in front of the 7-11 just down the street from the Bangkok 68 hotel but Ian, the man from Manchester that I have been running into repeatedly. He is standing with his girlfriend du jour, the somewhat ambivalent-looking young Thai woman he met on the plane to Bangkok. He is apparently sending her off home; initially things seemed to have taken off with her, but now she just wants to spend her days lazing around and looking at her phone. He seems to be a more adventurous type, not at all the regular tourist, very authentic, and with a vivacious manner of interacting with people around him. To say Ian is gregarious would be a profound understatement. He is apologetic about the fact that he hasn’t seen any of the designated attractions in town, and yet he enjoys this area detached from the rest of the city immensely, having traveled up and down the MRT line and explored the areas around the respective stations. 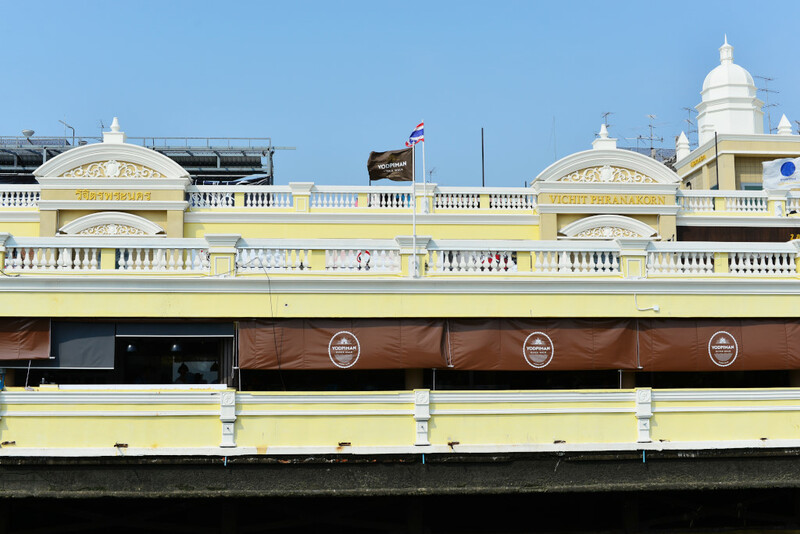 Once he has seen his Thai friend off, we cross the bridge to the other side of Ratchadaphisek to drop his bag of laundry off at some private residence. The alleys we walk through have interesting shops, the entire area entirely Thai with not a tourist in sight, pleasant, clean, the shops inexpensive, and the small market area that dominates the area not large but offering every manner of tasty food and beverage, a real gem that I can’t believe I have been utterly unaware of the entire time I have been staying in this area. Since Ian has no further plans beyond dropping his laundry off, I recommend that he accompany me into the city. 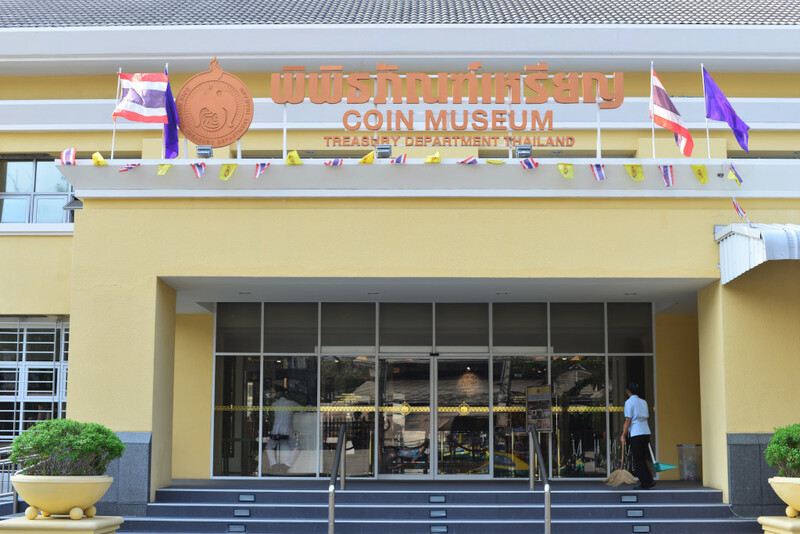 Since he doesn’t want to spend 500 baht on the Royal Palace admission, I suggest we go as far as the palace, at which point I can map out the worthwhile sights for him. Of course, that assumes we even arrive prior to the palace’s closure. If the palace is closed by the time we arrive, then we can go exploring together. 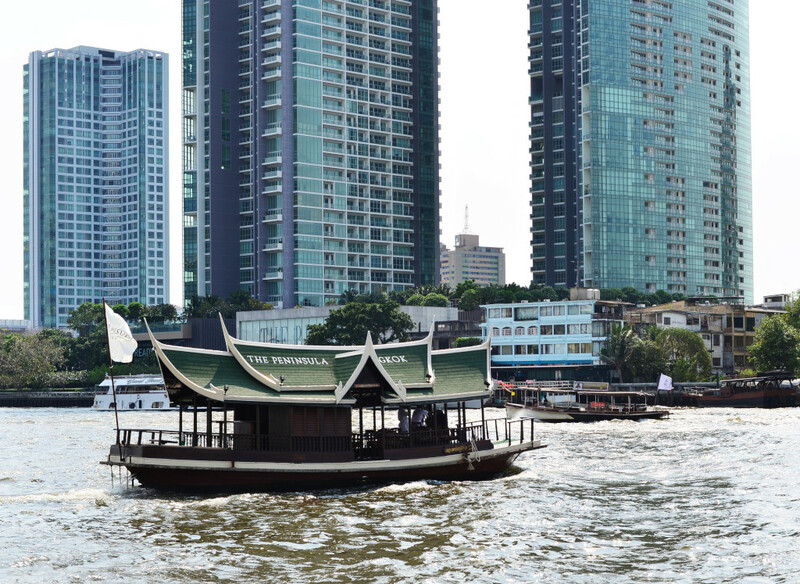 Given that Ian hasn’t seen any of the attractions in Bangkok, the area we traverse on the river is thrilling for him to behold. His enthusiastic reactions to the passing attractions makes the otherwise somewhat boring trip become more colourful. He is highly entertaining, telling stories, parodying other friends and relations, light-hearted and slightly caustic with a unique English twist. He decries others’ addictions to cell phone usage while he is constantly skimming information on his own phone. Ian apologizes for the poor quality photos he takes, but his night shots are no worse than the ones I take on a $2000 camera. 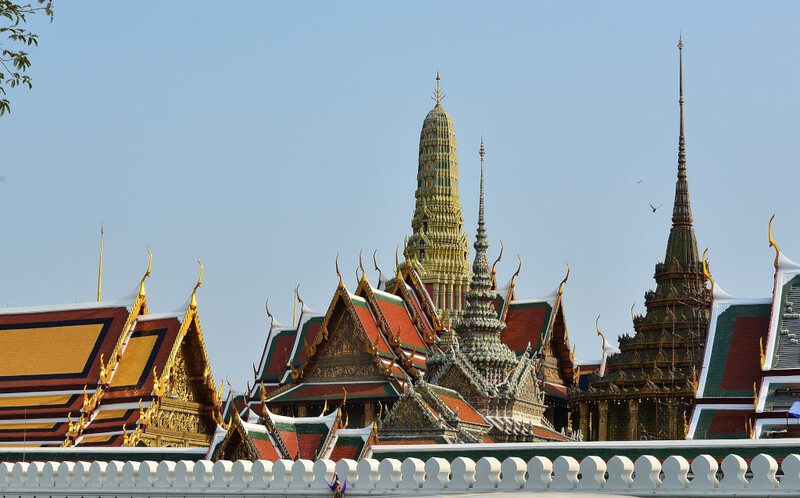 After seeing the Chao Phraya river in all of its glory, Ian proclaims that he will forfeit his train trip to Chiang Mai, not that he hasn’t been there already and actually really liked it – but he is liking Bangkok immensely, and there is so much to see in this city. We continue chatting as he remains glued to his phone or taking random shots. Weaving through the crowd at the jetty, I encourage Ian not to dawdle, as we are in the final stretch to the Royal Palace. We run into another group of Englishmen recently disembarked from a cruise ship, all eight of them looking for a place to stay tonight in town. 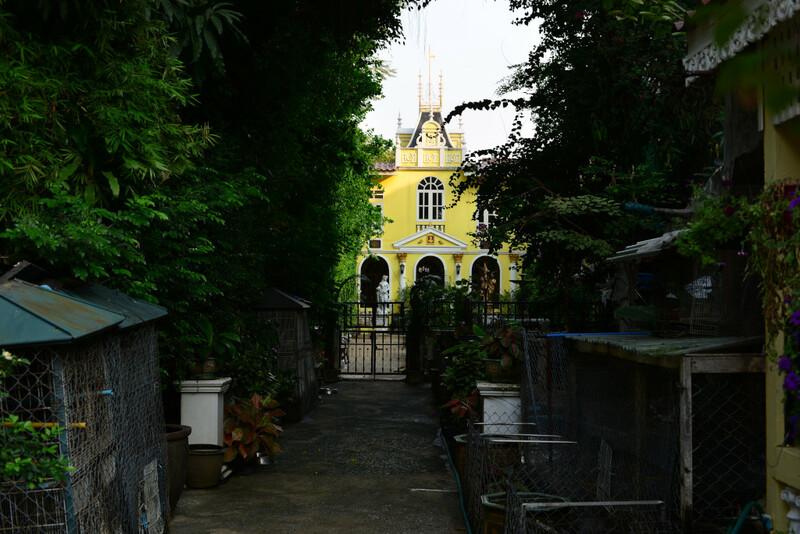 As Ian rants on to them about the Bangkok 68 hotel, I shake my head in disbelief, only to overhear one of the taxi drivers announcing to another tourist that the Royal Palace is now closed. So be it: the fates have yet again decided! We walk north from the Royal Palace as I point out the provenance of the respective buildings, but he is distracted, not that I feel offended, given how not compelling so much of what we are walking by is. I amble into the heavy traffic running along the roads north of the oval, but this is where Ian’s wanderlust ends, not wanting to wantonly risk getting run over. 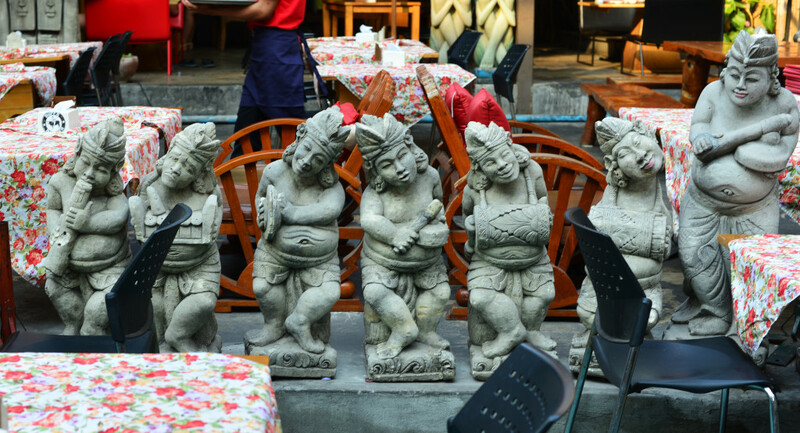 Closer to Khaosan road, we talk increasingly about life and the coming of age that extensive traveling gives rise to. Ian is far from some rote tourist, really a true traveler at heart, embracing the wisdom and strength gained from random and often bumpy excursions. The direction of our conversation is largely out of synch with the debauched superficiality of the area we are walking through. 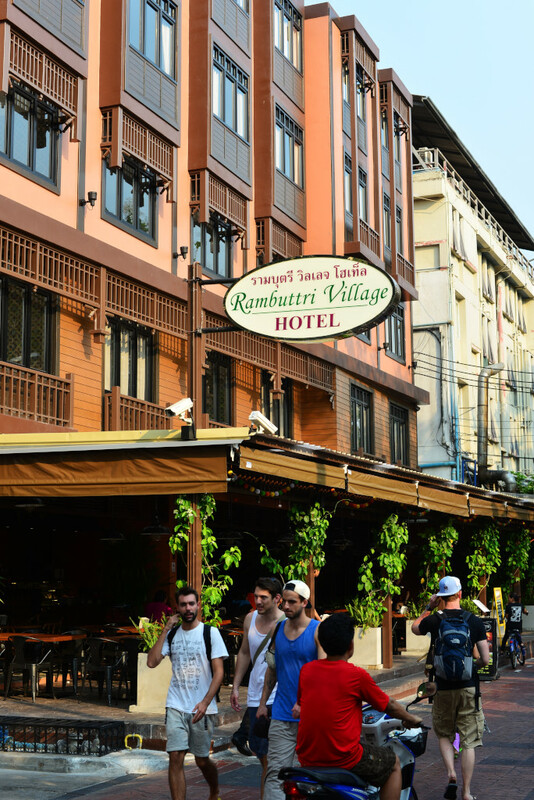 On Rambuttri Road, a somewhat more settled alternative to Khaosan, Ian inspects the plethora of T-shirts on display, waving off the taxi drivers, massage parlour workers, and waiters, a hardened, hardscrabble lot. The designs are intriguing and catchy, although with the vast offering across the world of cool T-shirts, it would be hard to determine whether anything here is truly original. What seems to be a specialty in Thailand is the designs that cover the entire shirt. At some earlier point of my life this may have mattered to me, but happily, old age has laid any desire or attempt at hipness to rest. 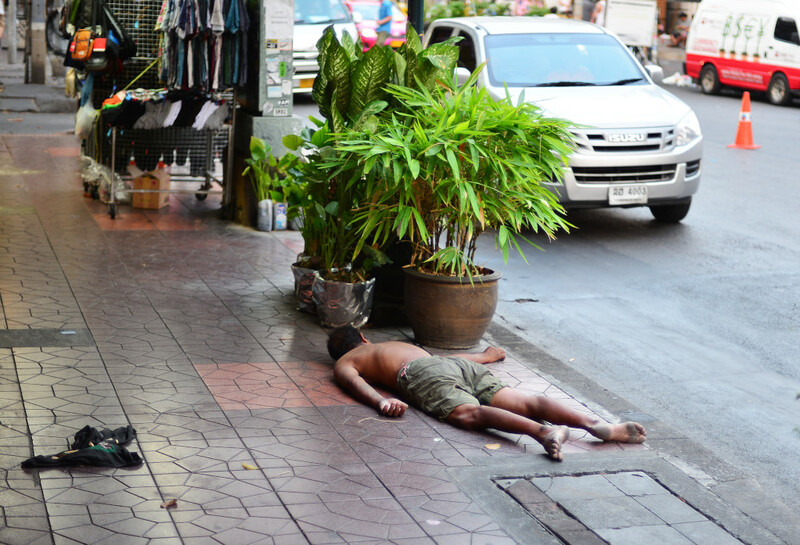 Thailand is also a major centre for knockoff clothing, so it would be worth spending some more money and buy clothing that conveniently … fell of some truck … Ian comments that he can’t imagine how anyone could walk around wearing a Singha T-shirt – well, that’s another issue entirely! It’s a pleasure hanging out with such a chatterbox, and it’s a rare treat to find someone who is more outgoing than myself. 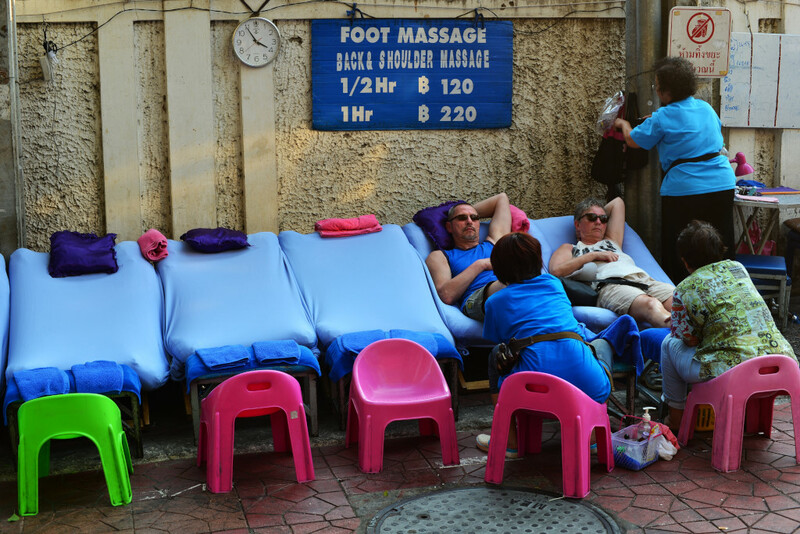 Having run out of Thai money, he needs to change more, and has found a place online with the best rate near Sukhumvit Road. Since it closes at 6 pm, we are obliged to return soon to the nearest jetty and head back. Savoring the moments on Rambuttri, he decides to change at the nearest booth, and now, no longer under pressure to leave, we are free to walk around here until the early evening, although we do need to leave before the last boat heads upriver. 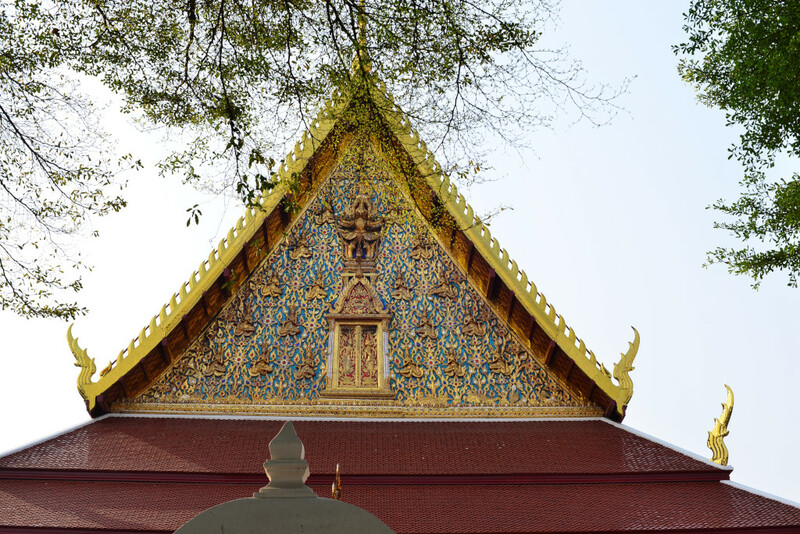 He comments on the amusing reactions he got in England regarding his traveling to Thailand: his boss insisted Ian was only going to Thailand for fornication, putting special and comical emphasis on the word, but then Ian sent him some photos of temples to prove otherwise. Another friend of his who would never do anything out of the ordinary told him Thailand was dodgy, Ian again comically articulating his words. He gives me examples of friends who will visit the most predictable and unimaginative places, adhering to utterly conventional experiences in terms of what they do, the food they eat, and so on. His brother is a case in point, financially very successful but unhappy and judgmental of others. Khaosan road proves to be as drab and uninteresting as before, although I can imagine it springs to life at night, not that I have been able to come here at that time of day, given that I am staying so far away (I definitely have no intention of spending unnecessary amounts of money on taxis, either!) Ian stares at the slow theater on Khaosan road in amazement, rhetorically asking why anyone would come here. Somewhere it is a testimony to the herd mentality that most people have, the street being a metaphor for the lowest common denominator tourism that the country seems to be a beacon for. Wandering through the street’s errant fray, Ian takes photo upon photo, then sends them to his brother as provocation, quickly showing me his brother’s dismissive reaction. 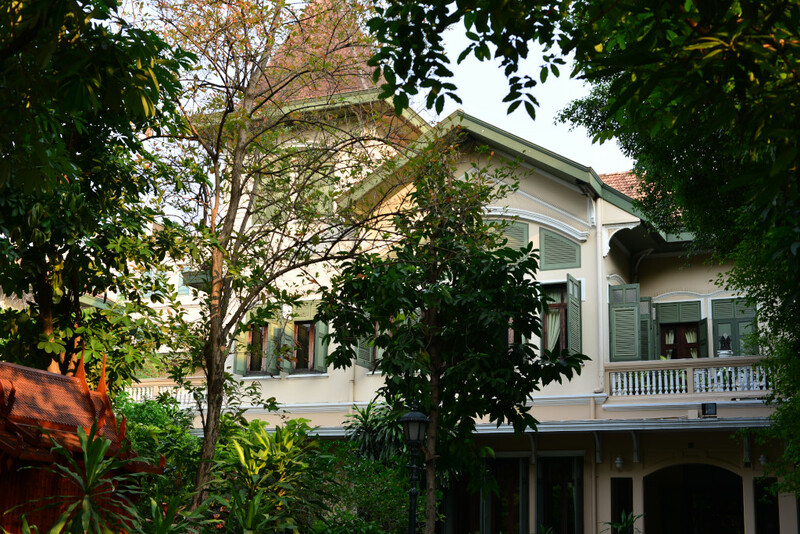 The goal of our meandering walk is ultimately Phra Sunem, the small fort that divides the debauched Khaosan road area with the much more pleasant and authentically Thai riverside neighborhood that runs up toward Dusit. 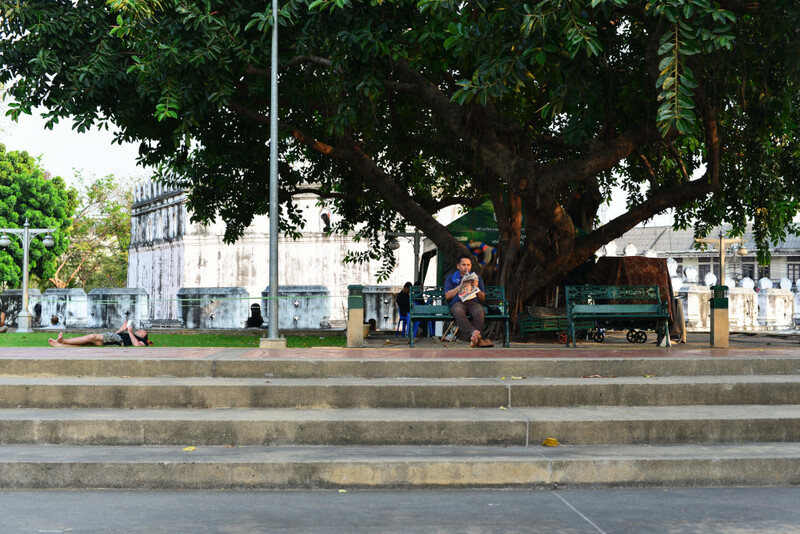 The seemingly modest eateries on Thanon Athit charge exorbitant prices, although the small plaza around the whitewashed fort is really one of the more charming spots in the central Bangkok. 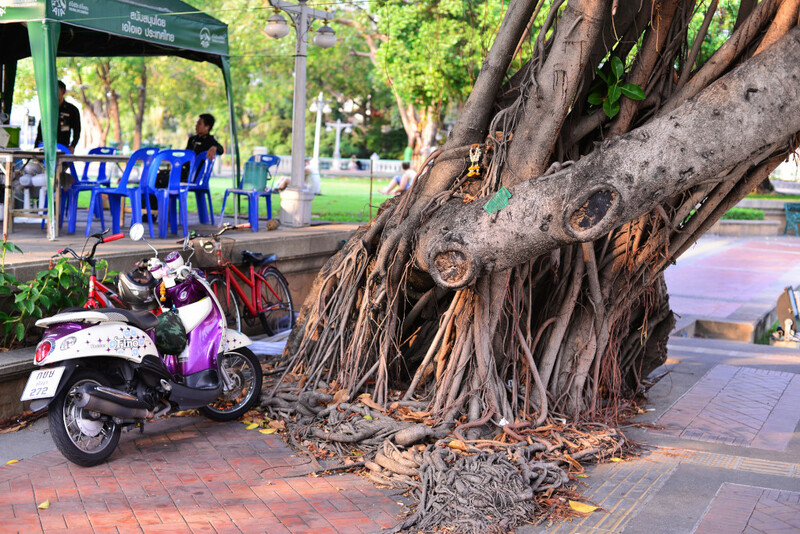 A tiny roadside coffee stall further east on Phra Sunem seems like a good place to stop for a while, our chatter continue onto various subjects, including the cloying political correctness that infects public and private discourse back home. He derides the same in England, claiming it’s also gotten quite difficult. How can one issue be admissible to talk about and another not? Why are some subjects suddenly untouchable and others not? Who decides? 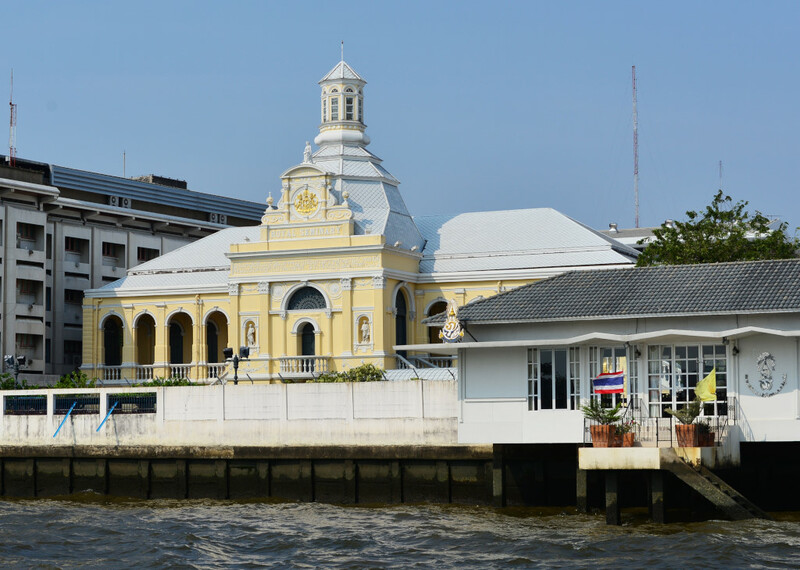 Our time is up and we need to rush to the jetty on Thanon Athit, otherwise we will be walking a long long way, or spending a lot on a taxi. The narrow corridor lined with market stalls leading to the jetty is virtually abandoned, not a good sign, and the crowd milling on the pier itself seems somewhat uncertain as to whether they will be able to travel downriver this evening. 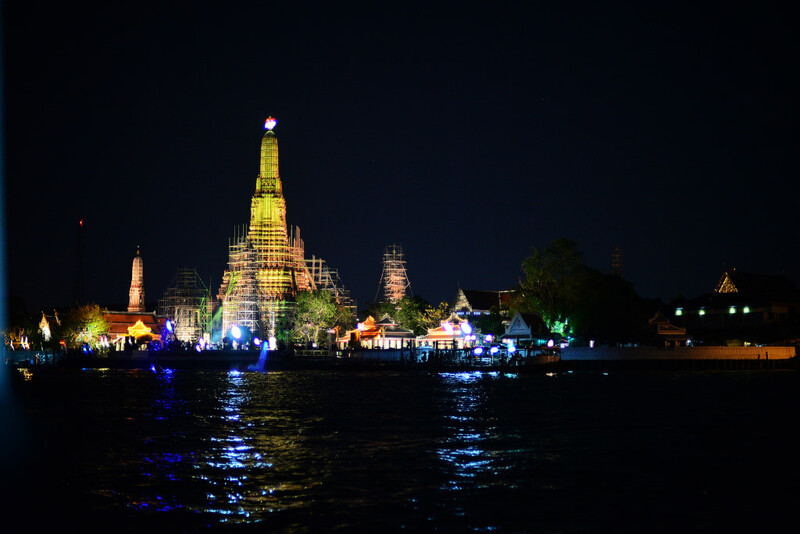 We are in luck though, one last ferry arriving not long soon after, the lot of us scurrying on board for an unintended night time excursion along the Chao Phraya. The city is a lit up at night, many boats strung with lights, a beautiful sight to see. 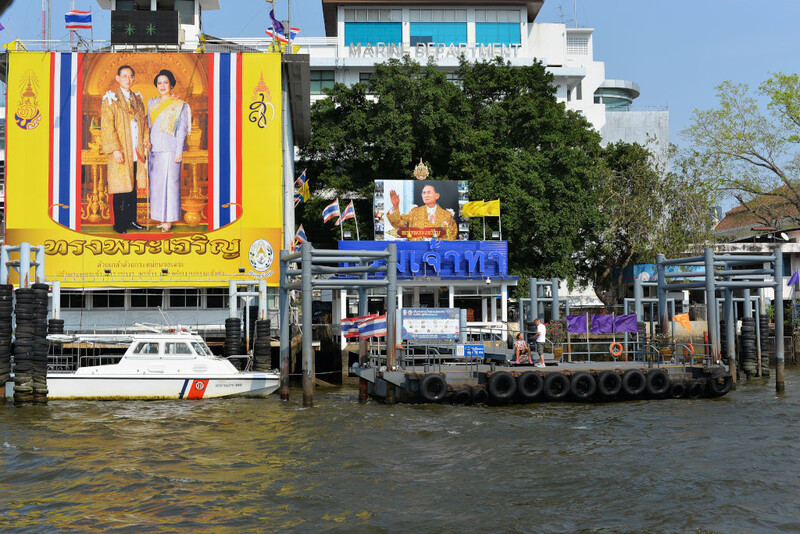 On one hand, it’s too bad you can’t take these boats later in the evening, and yet on the other hand, if I was staying in the general area of Khaosan road, I would probably just sink into the same mental quagmire as all the other backpackers mouldering in the area. Ian takes photos indiscriminatingly with his cell. I wish I was that inspired, but am plagued by having to mentally justify every shot, so that it all becomes stiff and somewhat contrived. He speaks to me of his Filipina girlfriend in England, who has tremendous positive qualities, but is incredibly jealous, continually texting him with the most minor suspicions. Then again, he told her he had gone to Portugal rather than Thailand. He recounts a humorous episode involving a phone call from here whereupon he quickly positioned himself next to the Portuguese and Spanish–speaking tourists at the pool. Women in general are never far from his mind. Changing trains between Silom and Sala Daeng stations, he compliments one of the many elegant young local women on her arresting earrings. The woman gives him a pained look, telling him somewhat contemptuously that perhaps he should be wearing them himself. 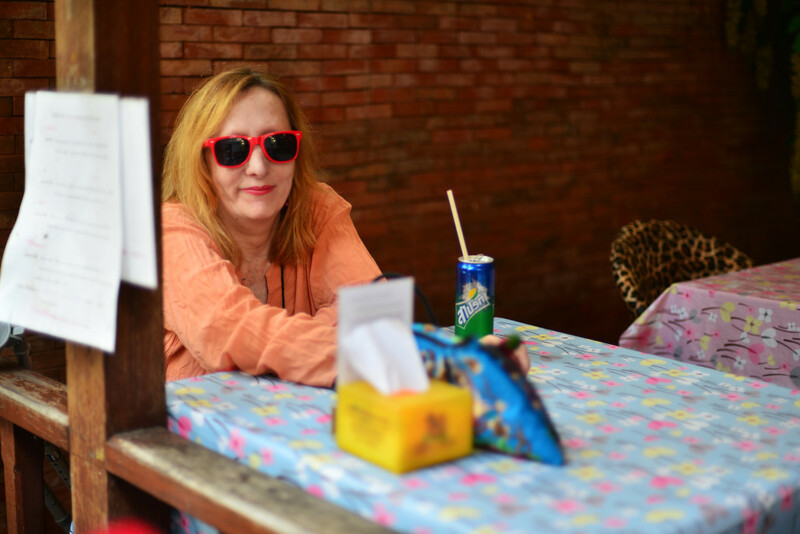 There may be better ways of dealing with innocent but unwarranted attention, but then Thai women are probably tired of being targeted by western men. And the amount of Thai women that have been dragged into effective prostitution at the hands of foreign visitors definitely sends a specific message …. On the metro heading to the Thailand Cultural Centre, he becomes engrossed with another woman, using the proverbial grapeshot approach, exchanging cute teddy bear avatar icons with her on Line. Communication with many locals, both young men and women, focuses on such exchanges that would seem utterly vapid to many westerners. 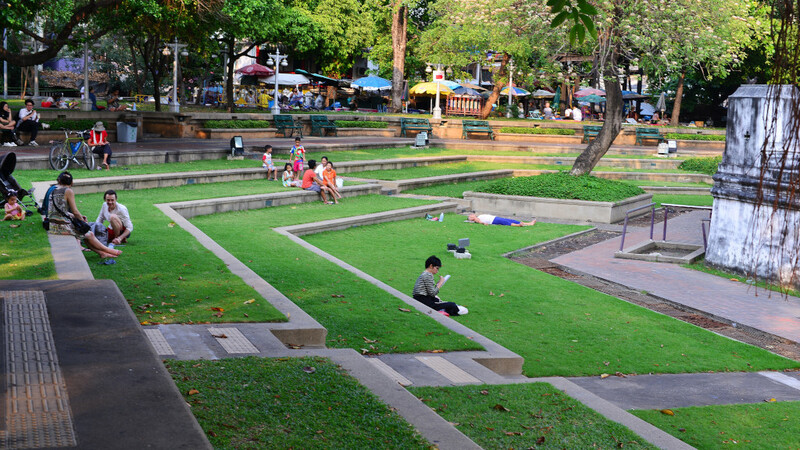 And true to his word, the area around the Thailand Cultural centre is filled with clothing and food vendors. 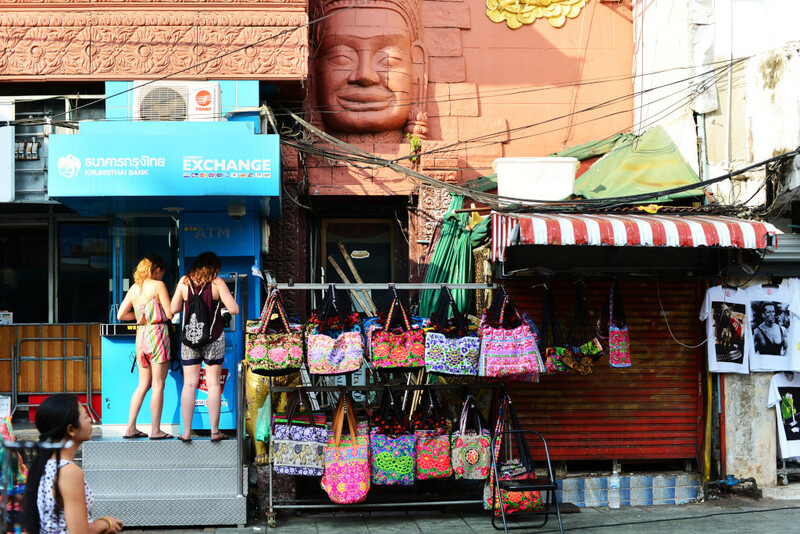 As enticing as it may be for tourists here, many of the people on the street spend long hours of their day trying to sell a few paltry goods to earn a pittance. We wander past the stands, towards a more organized set of eateries, and finally into the large adjoining shopping mall. The food fair inside in theory offers a wide variety of inexpensive local food, but the quality and portions are far from stellar, and somehow Ian manages to spend an unreasonable period waiting for a simple dish to be prepared. Our ultimate destination in the area is the small bar near the metro station entrance, which somehow doesn’t seem to warrant Ian’s laudatory references. Then again, there are some incredibly pretty young waitresses working at the bar, and as sexually provocative as their presence may be, Ian for once is not interested. The efforts of the day and the single beer have rendered him utterly exhausted, and I can barely get him onto the metro and back to Sutthisan station without him collapsing altogether.